We have a larger selection of jewelry for sale on our sister web site www.etsy.com. You'll find all of our handcrafted jewelry priced and ready to ship. 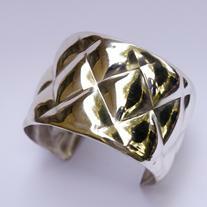 Sterling silver jewelry in contemporary designs. Circles intertwine for a fresh, light airy feeling. Each piece from the Olympia Collection is hand made. 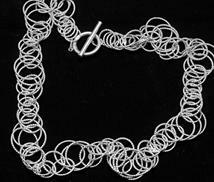 Starting with a simple long wire, each circle is formed individually, hand soldered and intertwined into the next circle to form this intricate design. Small Olympia earrings. These are a great fit and are the best every day earrings. 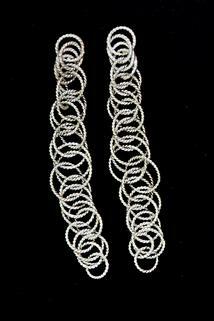 Long Olympia earrings. 2 inches in length. A great change from hoop earrings. Olympia bracelet. as light and comfortable as can be. Olympia Necklace. The lightest necklace with the biggest sparkle. Large intertwined circles make a bold statement but a light feel. 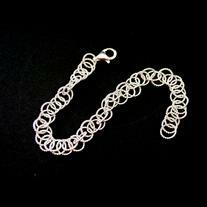 Sterling silver puff bracelet formed using chasing and repousse techniques. 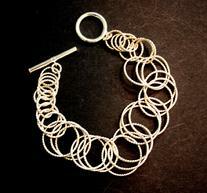 Sterling silver lattice bracelet. Each rung of the lattice formed and interlaced individually and finally fabricated as a whole. 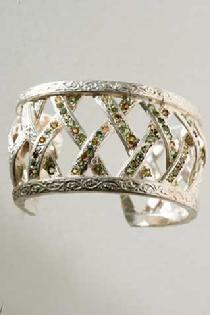 Set with sapphires, citrines and peridots. Price and availability on request. 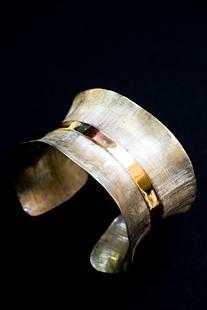 Sterling silver bracelet with 18K gold band forming a corset bracelet.